John McCain’s sordid travel history is back in the headlines. This time, it is his notorious visit to Syria in 2013 that is once again being put at the forefront of informed discussion due to a Syrian complaint filed with the United Nations regarding McCain’s illegal entry into the country in order to meet and coordinate with death squad terrorists slaughtering innocent people numbering in the hundreds of thousands. French Foreign Minister Bernard Kouchner, former Kuwaiti politician Walid Tabtabai, and former US diplomat Peter Galbraith were two other officials named in the Syrian letter to the UN; but McCain’s visit has drawn much more attention ever since it was revealed that McCain had not only met with the Commander of the Fundamentalist “moderate” rebellion known as the Free Syrian Army but also with a cannibal and the leader of ISIS himself, Abu Bakr al-Baghdadi. This meeting, of course, is in addition to the meetings that McCain has held with terrorists in Libya - fanatics he once called “heroes” and who then went on to murder US Ambassador Chris Stevens in the famous Benghazi incident. McCain also took the time to meet with Fascists and Nazis in Ukraine as the US-orchestrated color revolution was in full swing. McCain has responded to the letter from the Syrian government in the defiant fashion that typifies an individual that knows full well that he is above the law and not subject to the restraint of the same laws that apply to common citizens. McCain does not hide the fact that he entered Syria illegally. Nor does he deny the fact that he met with terrorists. 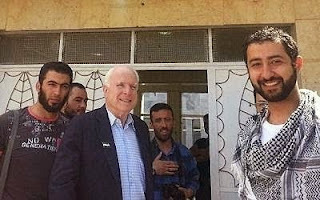 In fact, McCain only denies his meeting with one specific terrorist (Baghdadi), but his alibi is actually another terrorist (a member of the Northern Storm Brigade). Despite the reports and incessant coverage of McCain’s connections to these terrorists, his provision of material support to terrorism was only covered by the mainstream media when Rand Paul accused McCain of “unknowingly” meeting with the Islamic State. We do not expect that any other American citizen will be afforded the benefit of the doubt that Rand Paul provided John McCain or exonerated from prosecution for meeting with the Islamic State. We suspect these individuals will be accused of knowing full well who they are meeting with. Regardless, McCain’s meeting with the terrorists in Syria received a spate of mainstream media coverage as a result of Paul’s tepid accusations. 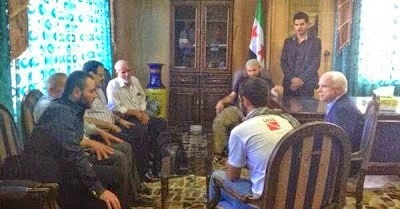 Indeed, the NY Times was called into action to “debunk” the evidence that McCain had met with terrorists, cannibals, and ISIS militants in Syria after the photographs of those meetings began circulating in the alternative media and more mainstream figures began to pick up on and run with them. As well as fighting alongside Al Qaeda the US vetted rebels have also defected to, and sold weapons and hostages to Al Qaeda groups. The line between the FSA and Al Qaeda groups is often blurred with entire FSA factions and individual fighters defecting to Jabhat Al Nusra or ISIS on multiple occasions , taking along with them the training and weapons paid for by US taxes in the process. An ISIS commander, Abu Atheer, told Al Jazeera that his group bought weapons from the FSA. The spokesman for the family of Steven Sotloff, an American journalist beheaded by ISIS, told CNN that US backed FSA rebels had sold Sotloff to ISIS for 25,00 to 50,000 USD. The White House denied the claim. However the claim was corroborated by Theo Padnos, another journalist held hostage in Syria, who said he was returned to his Jabhat Al Nusra captures by the FSA every time he tried to escape. Yet, for all its noble attempts to protect McCain’s terrorist sympathies, the evidence the organization provides in his defense is incredibly weak. Note that the only thing the Times could produce in the way of evidence was a counter-claim that simply said the accusations were “internet rumours” and that the person in the picture with McCain simply looks like Baghdadi. The idea that he is Baghdadi is considered an impossibility. The only other offering in the way of McCain’s defense was a statement by his own Communications Director, Brian Rogers, who claimed that the man in the picture was not Baghdadi but another individual associated with the Northern Storm Brigade, ironically a terrorist organizationin its own right. Northern Storm was famous for kidnapping a group of religious pilgrims crossing through Syria in September, 2012. In addition, around the same time that State Department official Victoria Nuland was announcing that the United States had allocated $5 billion to help bring about “democracy” in Ukraine and install a Western puppet, John McCain had traveled to Ukraine to meet with the neo-Nazi Svoboda Party and Euromaidan protest participants.